The average cost of memory care in Lexington County is $4,077 per month. This is lower than the national median of $4,650. To help you with your search, browse the 5 reviews below for memory care facilities in Lexington County. On average, consumers rate memory care in Lexington County 4.6 out of 5 stars. Caring.com has helped 5 families in Lexington County find high-quality senior care. To speak with one of our Family Advisors about memory care options and costs in Lexington County, call (855) 863-8283. Lexington County in central South Carolina has a population of 262,391, with 32,111 of those residents being 65 or older. Some of these seniors may have been diagnosed with Alzheimer’s disease or dementia. The number of South Carolina residents living with Alzheimer’s is expected to grow from 89,000 to 120,000 by 2025. To support this growing demographic, Lexington County is home to seven memory care facilities. In Lexington County and all of South Carolina, memory care facilities are referred to as Assisted Living Facilities (ALFs) and Community Residential Care Facilities interchangeably, with both being licensed and regulated by the Board of Health and Environmental Control, Division of Health Licensing. Lexington County’s cost of living ranks 93.2 on a scale where 100 represents the U.S. average, with transportation and healthcare both slightly higher at 104 and 105, respectively. Housing and groceries are both lower than the average, which can make the area affordable for seniors’ families. On a scale from one to 100 where one represents the safest areas to live, Lexington County has a violent crime rating of 41.18, more than ten points higher than the national average of 31.1. However, property crime in the county rates 39.5 and is almost on par with the national average of 38.1. Seniors and their families might want to ensure that prospective facilities in the area have security protocols in place to protect residents from becoming victims of crime. 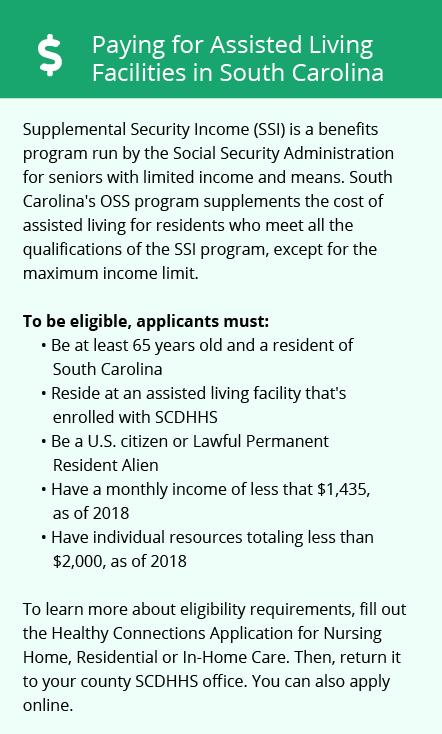 Seniors living in Lexington County might benefit from South Carolina’s tax laws. Retirement savings account withdraws and pensions are partially taxed, but Social Security income is not. These tax savings might help seniors extend their memory care budgets. The climate in Lexington County is comfortable with July highs hitting 92 degrees and January lows remaining above freezing. Sperling’s Comfort Index gives the area a rating of 72 out of 100 compared to the national average of 54, which means Lexington County might be a good place for seniors with joint discomfort and other conditions exacerbated by weather conditions to live. Memory Care costs in Lexington County start around $4,077 per month on average, while the nationwide average cost of memory care is $4,798 per month. It’s important to note that memory care rates in Lexington County and the surrounding suburbs can vary widely based on factors such as location, the level of care needed, apartment size and the types of amenities offered at each community. 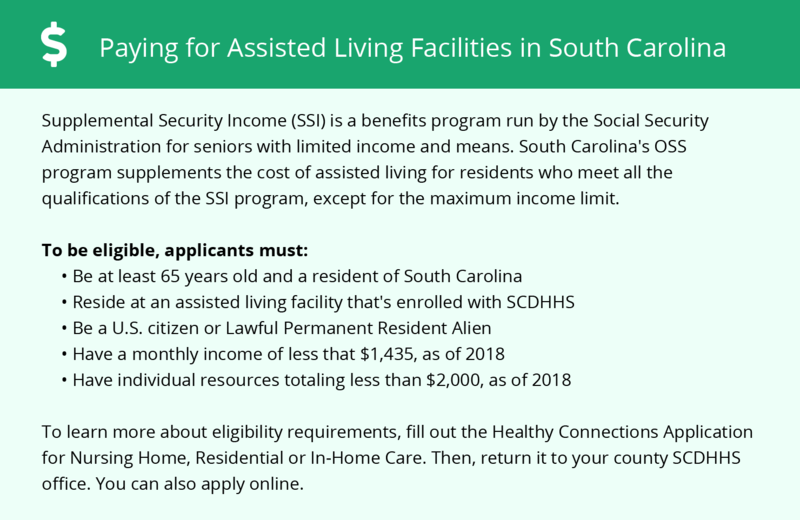 Lexington County and the surrounding area are home to numerous government agencies and non-profit organizations offering help for seniors searching for or currently residing in an assisted living community. These organizations can also provide assistance in a number of other eldercare services such as geriatric care management, elder law advice, estate planning, finding home care and health and wellness programs. To see a list of free memory care resources in Lexington County, please visit our Assisted Living in South Carolina page. Lexington County-area assisted living communities must adhere to the comprehensive set of state laws and regulations that all assisted living communities in South Carolina are required to follow. Visit our Memory Care in South Carolina page for more information about these laws.